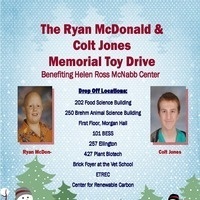 The 2018 Ryan McDonald and Colt Jones Memorial Toy Drive is upon us. Please see the attached flyer for information about the toy drive and to find a donation location near you. Donations will be accepted November 13 until December 10. This annual toy drive is held to honor Ryan and Colt, two teenagers who were the victims of teasing and bullying in school. Ryan’s life was taken by school violence when he was shot at Central High School in August 2008, and Colt took his own life in October 2012 when the bullying became too much for him to endure. Both young men were 15 years old when they died. Please help us keep their spirit and memories alive.